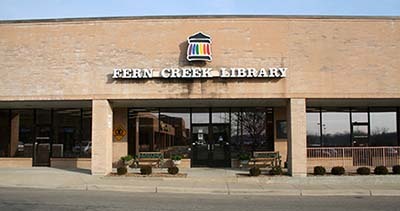 The Fern Creek Library is located near the Gene Snyder Freeway and serves the burgeoning Fern Creek community. Fern Creek Library features, in addition to services offered by all other Libraries, a public meeting room. From the Watterson Expressway - Take the Bardstown Road South Exit. Drive south on Bardstown Road past Bashford Manor Mall, Breckinridge Lane, Hurstbourne Lane, and Beulah Church Road. Make a right at the light after Beulah Church Road, into the Cedar Springs Shopping Center. The library is on the north end of the shopping center, on the opposite end from the Kroger. From the Gene Snyder Freeway - Take the Bardstown Road exit. At the end of the ramp, go north toward Louisville. Make a left at the next light into the Cedar Springs Shopping Center (.2 miles). The library is on the north end of the shopping center, on the opposite end from the Kroger. The people of Fern Creek have consistently supported libraries, founding the Fern Creek Community Library in 1937 with donations from the Louisville Free Public Library. The original library was housed in the Fern Creek Community Center and staffed by members of the Fern Creek Women's Club. The Library became a member of the Louisville Free Public Library in 1963 and remained a part of the system until funding challenges forced the Library to close in 1986. A grassroots, residential effort, kept the Library open through the work of volunteers, donations, and a grant provided by County Commissioner Irv Maze. The Fern Creek Library rejoined the Louisville Free Public Library system on November 29, 1993, in a new location north of the Community Center on Bardstown Road. The Library relocated in June, 1999, to its existing location in the Cedar Springs Shopping Center. A 2006 expansion increased space by nearly 25%, adding an imaginative children’s area.